Traditional project management techniques are not working as well as expected. According to research, an average organization has at least $74 million USD (yearly) in at-risk projects. And, even when projects are executed successfully, all too often they still fail to deliver business benefits. So, how do you get started? How do you prioritize which issues to address first? What are the risks and potential rewards? What can you do yourself and where can you need help? This paper helps you answer those questions. It provides important insights into the root causes of project failures and misalignment with business unit expectations, along with possible solutions. 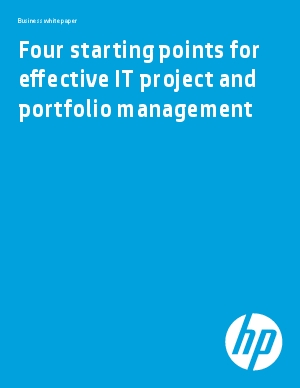 It illustrates the path to optimized project and portfolio management from four different starting points, and provides step-by-step advice to help you reach new milestones quickly. It is intended to help you make the transition from managing IT projects to managing business outcomes.